Well, folks, it's finally here – after maybe two years of rumors and speculation, Apple has finally announced the iPad Pro. A 12.9” monster of a tablet, looking to be the ultimate mix between a media consumption device and productivity machine. Looking at it, one can't help but draw parallels between it and Microsoft's attempt at a laptop-tablet hybrid – the Surface Pro 3. Indeed, the latter comes with its very own stylus and has an optional keyboard cover to boost productivity. Apple has went the same way, though both its stylus, dubbed Apple Pencil, and its Smart Keyboard are optional purchases. The cover is a full-sized keyboard, water- and stain-resistant and highly durable, with Apple promising a lifetime of use. The buttons under each key employ similar tech to what was used with the newest MacBook and Cupertinians promise even feedback across keys for comfortable use. The Smart Keyboard connects to the iPad Pro via the Smart Connector – 3 dots, present on the side of the tablet, which are used to make contact and transfer data between the slate and the accessory. Additionally, iOS will be able to recognize when the Smart Keyboard is in use and “adapt”. What we saw at the presentation is that the software hides the virtual keyboard to make full use of the 12.9” screen, but seeing as the Smart Keyboard has Control, Option, and Command keys, we wouldn't be surprised if some apps make great use of them. The keyboard cover for Apple's gargantuan tablet will set you back $169 and will be available in November for the iPad Pro's launch. Would have made more sense to have even a cut-down version of OS X. Just a bigger iPad, with support for a $100 stylus. Same here. If it had osx, the price would be justified. It's just an impractical and expensive toy. You can get mackbook air for its price. This is an utter fail imho. I bet you this "utter fail" will still sell millions. Even more than the Surface Pro. Of course it will sell more than the "Surface Pro". It will not sell more than the "Surface Pro 3". There is no niche for the IPad pro, the only place it can take sales from is the slumping IPad and android tablet market. Enterprise won't adopt the IPad Pro because IOS is the least secure mobile platform. You could ball up a turd, slap an Apple logo on it, and it'll sell millions. Brand power, marketing, and human nature to want what others have has led to them selling to the blind and hopeless. That hasn't worked with Macs or MacBooks. The price wouldn't even be justified then unless you were allowed to run Windows on it to make it more useful. lol..
Oh how I hate you PA. Microsoft's attempt at a laptop-tablet hybrid. ATTEMPT? really? Has there been a more successful device that combines the best of a laptop and tablet? NO. 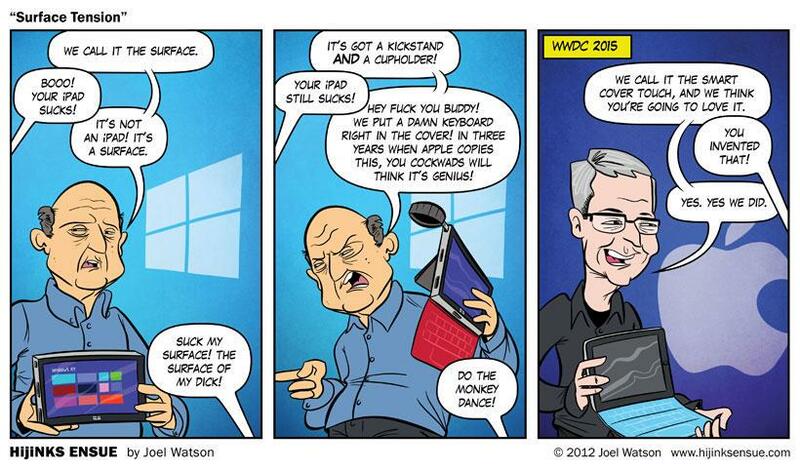 I love how this article insinuates that the iPAD pro and the surface are similar. until the iPad runs a full OS, it's extremely limited compared to the surface. Oh look, it's a Surface. Surface RT maybe. Don't lump this POS with the Surface Pro. they prefer to just sell you the separate toaster and refrigerator for 2x the price..
Ah, but what if you were to make it so that the refrigerator automatically feeds your bread to the toaster? You just have to enter the number of slices and press "Toast". Tim Cook may eventually learn that innovation is possible anywhere and needed everywhere. Finally its a galaxy Note tablet. 33 Apple articles in the past 3 hours. I like Apple, but you guys are doing far too much especially since content is lacking. For PA christmas has arrived very early!! The Type Cover for the Surface is $40 cheaper and has a trackpad. Only Apple has the cojones to pull this off and make their suckers er, customers, feel like they got a bargain. A dud compared to Surface Pro 3.